One of the best things about Christmas decorating is opening up all the storage boxes and seeing all your favorite things that you haven't seen in a year. When it came time to start decorating, I immediately began with my woodland tree. 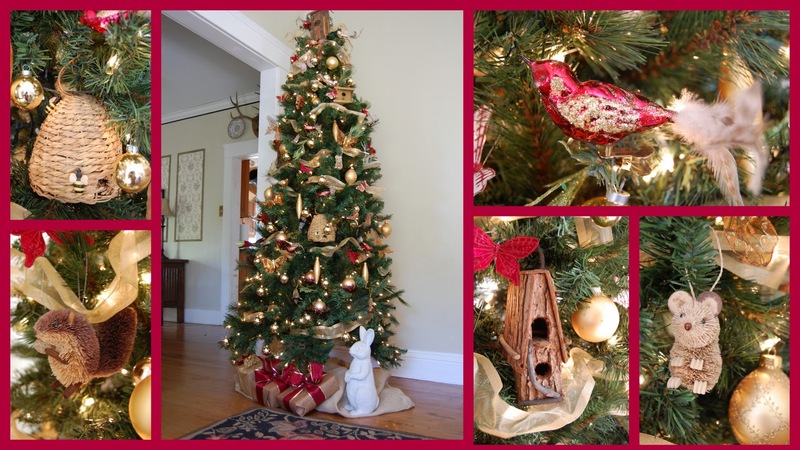 This tree features forest animals, birds, birdhouses, gold ornaments, and a bee skip. I must admit, I had a very difficult time photographing this tree and all its details. In person, it is much prettier. I love the woodland theme. Your tree is very lovely. Have you been to World Market this year? It's filled with all kinds of lovely woodland-themed ornaments. I came home with a bag full yesterday. Oh it really looks pretty...I love that you made a collage. It is all so cute! Your tree looks amazing to me! I really like themed trees and all your ornaments are adorable! Look at you - done with a tree already! I just opened my boxes tonight and you're right it was fun. Your tree is beautiful. I love the woodland theme. Your ornaments are perfect! Love this - so pretty and different! Just beautiful! I love the woodland theme. I am using that too, especially on the mantel. Beautiful tree! I love the natural look. I love the theme, so pretty! Love the feeling too. Opening those storage boxes is like opening a Christmas present! Love it. Oh and love your Christmas tree. How cute is the sweet little bee hive. Where on earth did you get that? You're not going to believe it, but I've been wanting one forever...I even tried to make my own out of twine and syrofoam...I should do a post about it...maybe?